Every year is another banner year for the AV industry and 2018 will be no different. Technological advances are coming at us every day, and with them follows wave after wave of product innovations that harness newfound capabilities to solve problems for the AV world. 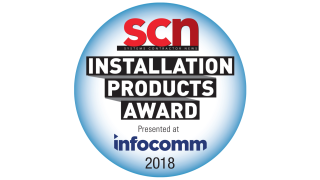 It’s happening quicker than we ever imagined, and at SCN, we’re happy to celebrate these fine new products during InfoComm with our annual Installation Product Awards. The 2018 SCN InfoComm Installation Product Awards will showcase the most innovative commercial AV products of 2017, and winners will be announced at InfoComm 2018 in Las Vegas, NV. To be eligible for an award, companies must exhibit at InfoComm 2018, and the product must have shipped in 2017. Each product entry is $295 and must be entered via the form below. Manufacturers must enter their product(s) for consideration before April 13, 2018. So, don’t delay—submit your entry now. Please send one high-resolution image of each product entered to SCNawards@gmail.com.